This is one of those 'first ever...' photos- so a little history story could be told. But more than that, and unlike most of the early images, it has quite an aesthetic. And the two stick figures in the foreground add a certain something human too... Are they children playing? The Frenchified nature of the town is given by those shop awnings and ordered lines of trees - as well as perhaps more obscurely, by the slope of the roofs. On closer inspection, the figures turn out to be adults, and one is offering his boot via an extended leg to the other, who presumably is a shoe-shine boy. Thus, the image captures in a frozen moment of time, a slightly sourer taste of social inequality. It is a daguerrotype, an image recorded on a sheet of copper coated with silver and developed by mercury fumes, taken by Louis-Jacques-Mandé Daguerre (after whom the process was named). The exact date of the photo is not known, but it is thought to be either 1838 or 1839. Following on from the artistic era of Romanticism, photography fitted well the artist's needs to express the real and natural. But above all, this mechanical medium seemed to fit the industrial revolution and the need for man to fix himself into particular roles. Because, indeed, another quality of the image is that there are only these two figures, locked forever in their unequal relationship. What should have been a bustling boulevard is strangely deserted. This appearance is, however, also illusory: the first daguerrotypes took some minutes (10 to 15) to fix on the plate, and so all that moves is removed... moving objects, like coaches or even pedestrians, would leave little or no trace. They are the ghosts of early photography. *Others would argue the point, including earlier images by Daguerre himself such as Foyer au Pont-Neuf, but if there are literally other figures to be found, none are as striking and problematic as these two. The Daily Mail writes about this photo: 'Going about his daily business, he paused for just a few minutes in the middle of a Parisian street. But unbeknown to him, this man could have inadvertently made history as the first human ever to be photographed.' Then, half way through the Daily Mail article: 'There is also the very faint image of the bootblack'. You refer to 'particular roles' in your post, which are the roles of ... visible and invisible? A little historical trivia, for photographic context as to place and time . . .
Those two years have the dubious bragging rights of marking the fearsome-sounding ‘Pastry War’—yes, pastry war. An ill-considered dust-up between France and Mexico—also dubbed the ‘Guerre des Pâtisseries’, or to the Mexicans, ‘Guerra de los Pasteles’—that petered out within a few months. And which—not to quibble—never should have happened. The donnybrook stemmed from Mexican army troops, ransacking homes and businesses, including a pastry shop owned by a French national, Monsieur Remontel. After ten years of the pastry maker demanding reparations from Mexico, and being rebuffed, le monsieur protested to the French government—which, riled up over the looted pastry shop and Monsieur Remontel left with pie on his face, and in an act of chauvinistic overreaction, sent a naval fleet to settle the matter. Apparently the navy had nothing better to do than ‘rattle its sabers’ over a trifle. Éclairs, bichons au citron, and croissants trumping levelheadedness, perhaps. Inglorious circumstances all around. Who knows: Perhaps the two citizens in this photo were exchanging patriotic views of their country’s martial victory—if they were even aware or cared. Haunting photo, Tessa and Martin . . . Right on its heels, in October 1839(! 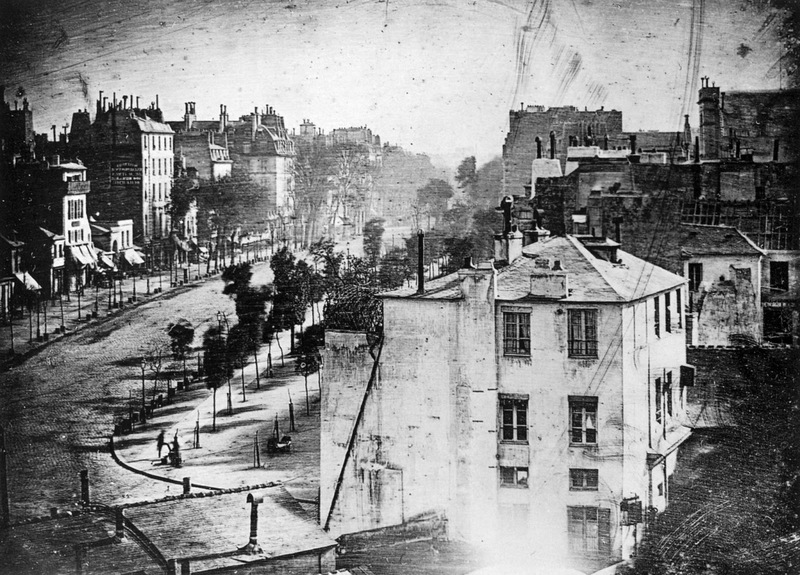 ), another photograph of a human being joined the annals—just edged out by Daguerre’s. This one, by Robert Cornelius, is claimed to be the first self-portrait (the first ‘selfie’?). More here, from the ‘Huffington Post’ . . .